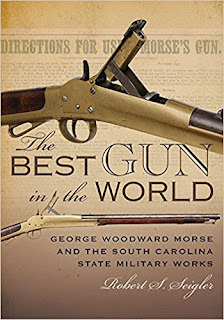 The Best Gun in the World: George Woodward Morse and the South Carolina State Military Works, Robert S. Seigler, University of South Carolina Press; 288 pages; 9 color photographs, 71 black and white photographs, notes, index, bibliography, $49.95. A year after seceding from the Union, South Carolina faced the daunting challenge of equipping soldiers with weapons, ammunition, and other military implements during the American Civil War, a problem faced by the Confederate States government as well. In The Best Gun in the World, Robert S. Seigler explains how South Carolina created its own armory and then enlisted the help of a weapons technology inventor to meet the demand. Seigler mined state and federal factory records, national and state archives, and U.S. patents for detailed information on weapons production, the salaries and status of free and enslaved employees, and other financial records to reveal an interesting, distinctive story of technological innovation and industrialization in South Carolina. George Woodward Morse, originally from New Hampshire, was a machinist and firearms innovator who settled in Louisiana in the 1840s. He invented a reliable breechloading firearm in the mid-1850s to replace the muzzleloaders that were ubiquitous throughout the world. Essential to the successful operation of any breechloader was its ammunition, and Morse perfected the first metallic, center-fire, preprimed cartridge, his most notable contribution to the development of modern firearms. The U.S. War Department tested Morse rifles and cartridges prior to the beginning of the Civil War and contracted with the inventor to produce the weapons at Harpers Ferry Armory. However, when the war began, Morse, a slaveholding plantation owner, determined that he could sell more of his guns in the South. The South Carolina State Military Works, originally designed to cast cannon, produced Morse’s carbine and modified muskets, brass cartridges, cartridge boxes, and other military accoutrements. The armory ultimately produced only about 1,350 Morse firearms. For the next twenty years, Morse sought to regain his legacy as the inventor of the center-fire brass cartridges that are today standard ammunition for military and sporting firearms. Robert S. Seigler, a South Carolina native, is a recipient of the Order of the Palmetto (the highest civilian honor in South Carolina) and is a fellow in the Explorers Club and the Royal Geographical Society. He is the author of eight books and several journal articles about South Carolina’s Civil War history. Seigler practices medicine in Greenville, South Carolina, where he is the medical director of the pediatric intensive care unit and a professor of pediatrics at the University of South Carolina School of Medicine Greenville. Braxton Bragg: The Most Hated Man of the Confederacy, Earl J. Hess, North Carolina University Press, 361 Pages, 28 illustrations, 2 maps, notes, index, bibliography, 2016. $35 hardcover. This superb study of Braxton Bragg is very aptly subtitled. A punch line of many a joke at conferences and Civil War roundtables, Bragg has fared poorly in both the war's historiography and its popular memory. The conventional image oi the general is of an obtuse, irascible, cold-hearted, and incapable officer who, more than any other Rebel leader, doomed the confederacy. He poisoned relations within the western Confederate high command and stymied the South's war effort on both the strategic and tactical levels. While some of this rings true, the prolific Civil War historian Earl Hess has now given readers a more proficient, nuanced and, indeed, human Braxton Bragg. While the general was far from a flawless field commander, Hess argues that his wartime failures were more personal than military. It was, he posits, Bragg's stubborn recalcitrance and poor relations with his subordinates and the Southern press, that more than anything else, damaged his reputation. Like many of the South's generals, he proved to be a poor politician. He rarely courted Southern newspaper editors and proved remarkably clumsy when he tried to. . . . .
Full Text is continues at Michigan War Studies Review, November 13, 2017. 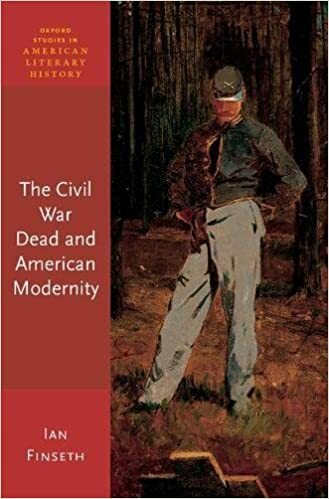 From The Publisher: The Civil War Dead and American Modernity offers a fundamental rethinking of the cultural importance of the American Civil War dead. Tracing their representational afterlife across a massive array of historical, visual, and literary documents from 1861 to 1914, Ian Finseth maintains that the war dead played a central, complex, and paradoxical role in how Americans experienced and understood the modernization of the United States. From eyewitness accounts of battle to photographs and paintings, and from full-dress histories of the war to fictional narratives, Finseth shows that the dead circulated through American cultural life in ways that we have not fully appreciated, and that require an expanded range of interpretive strategies to understand. While individuals grieved and relinquished their own loved ones, the collective Civil War dead, Finseth argues, came to form a kind of symbolic currency that informed Americans' melancholic relationship to their own past. Amid the turbulence of the postbellum era, as the United States embarked decisively upon its technological, geopolitical, and intellectual modernity, the dead provided an illusion of coherence, intelligibility, and continuity in the national self. At the same time, they seemed to represent a traumatic break in history and the loss of a simpler world, and their meanings could never be completely contained by the political discourse that surrounded them. Reconstructing the formal, rhetorical, and ideological strategies by which postwar American society reimagined, and continues to reimagine, the Civil War dead, Finseth also shows that a strain of critical thought was alert to this dynamic from the very years of the war itself. The Civil War Dead and American Modernity is at once a study of the politics of mortality, the disintegration of American Victorianism, and the role of visual and literary art in both forming and undermining social consensus. Lionsgate, Appian Way To Make Ulysses S. Grant Film; Option Ron Chernow Bio, Mike Fleming, Deadline Hollywood, online, November 1, 2017. 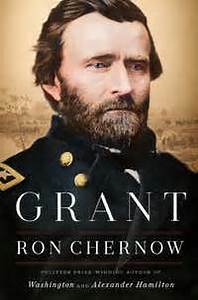 Lionstate and Appian Way have acquired movie rights to Grant, the new bestselling Ron Chernow biography of Ulysses S. Grant. David James Kelly has been set to adapt. Chernow is the Pulitzer Prize winning author of Washington: A Life, [and] whose Alexander Hamilton was the inspiration for Lin-Manuel Miranda’s Tony winning musical Hamilton. [Film] will be produced by Appian Way’s Leonardo DiCaprio and Jennifer Davisson, with Chernow the exec producer.